Two things are important when making a pasta salad – the pasta you choose and the sauce. 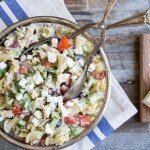 This Greek Pasta Salad recipe has both plus a abundance of fresh veggies (all in season right now) and a generous amount of cheese. This is pretty much my ideal pasta salad. I recently found a great source for pasta – Harmon’s Grocery Store. They make artisan pasta in small batches using bronze cut production. While most industrially produced pasta is cut with tephlon, resulting in a more shiny pasta, bronze cut pasta is more rare and usually more on the expensive side. What does it all matter to you and I?? Well, sauce clings well to the rough bronze-cut texture so the sauce doesn’t slide off and end up in a puddle on your plate. More flavor and less waste, two more of my favorite things! Pretty much everything that’s in abundance at the farmers market right now can be thrown into this salad – tomatoes, cucumber, herbs, or bell peppers (not on the ingredient list but they would be great in here)! Zucchini or squash could be added in too. 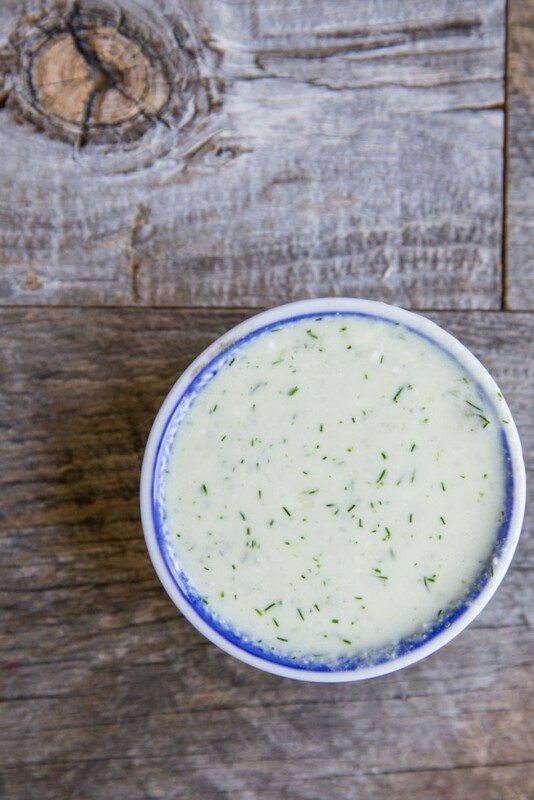 Get the Recipe for Greek Yogurt Dressing Here. 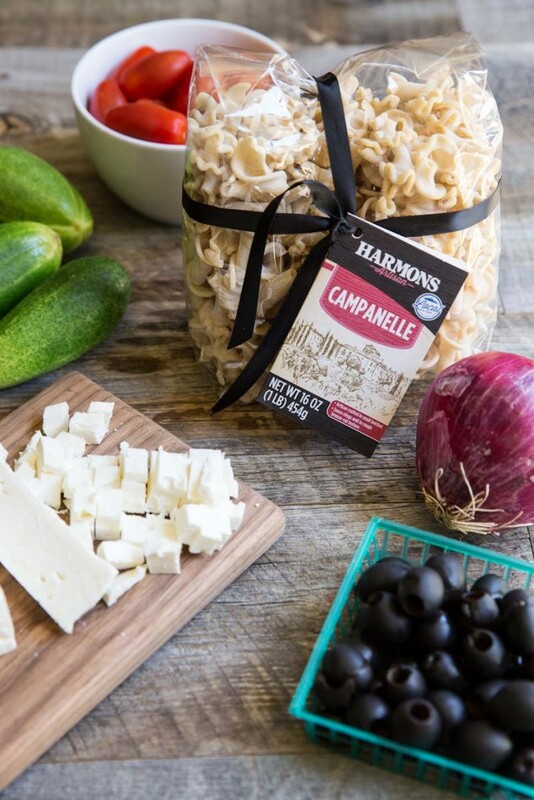 More about Harmon’s Pastas – they’re artisan crafted in small batches in Salt Lake (not made in-house). Also, if you have one of the flavored pastas, they’re great with or without sauce. You can just toss with olive oil or butter. Yes, please!! Good pasta and good sauce make just that much better! 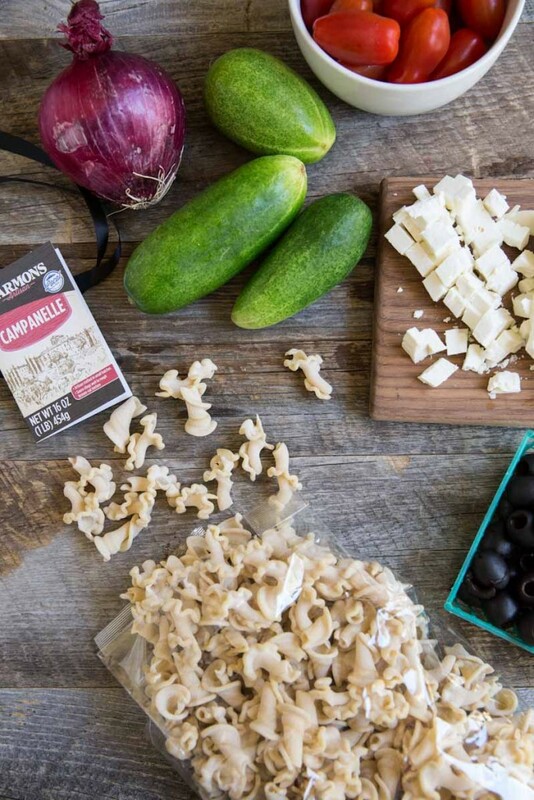 Take this pasta to your next summer picnic! 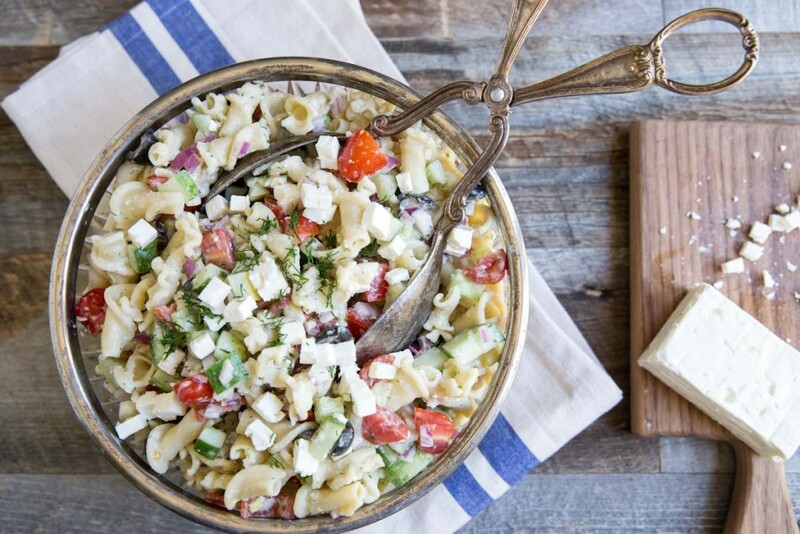 A pasta salad recipe with greek veggies and a creamy yogurt dill and feta dressing. Mix together ingredients for the dressing according to the recipe. Heat a large pot of salted water to a boil. Add in pasta and cook according to package directions. Drain then toss with a teaspoon of olive oil. Spread the warm pasta out onto the large baking sheet to cool and prevent sticking. While the pasta is cooking, cut up the veggies. Quarter the cherry tomatoes, dice the cucumbers, dice the red onion, and quarter the olives. Once pasta is cool, toss with the veggies and season with a little salt and pepper (1/4 teaspoon of salt and 1/8 teaspoon pepper should be good). Right before serving, pour the dressing over the salad and toss to combine. (If you add the dressing to early the pasta will soak up all of the flavor and liquid). Agreed, those are the two most important things! I’ve seen those pastas (right when you walk into the store). I’ve wondered how they were. Glad to hear they are up to your standard. Can’t wait to try, friend! Yeah, you’ll have to let me know what you make when you give the pasta a try! That looks positively amazing!! 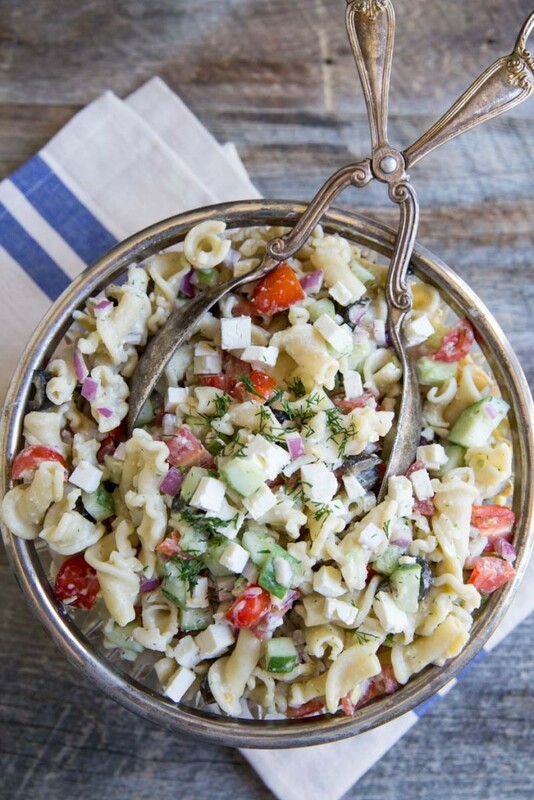 I adore pasta salads, and the “Greekness” here is right up my alley. Love this recipe! Thanks so much Kim! Great to hear from you. I hope you had a wonderful summer! I want to eat this whole bowl by myself! Yum! Haha Sommer! I definitely could too!